THIS is the first time I’ve ridden a Suzuki DR-Z400 of any sort and to be honest I think the bike is great fun to ride, and I can also appreciate why it’s been on the market relatively unchanged for so long. 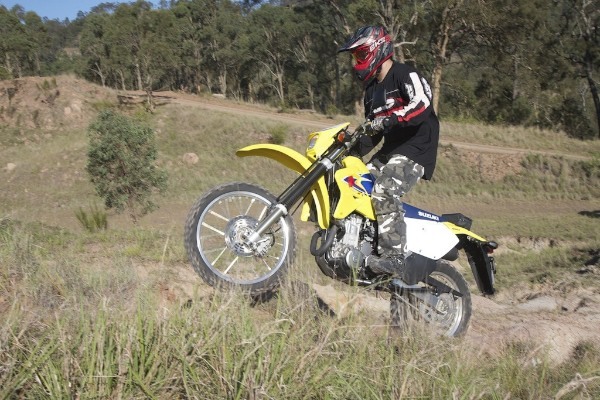 And while I personally own a Husqvarna TE310 and love the way that bike performs in the bush, I see the DR-Z400E as tested here, as being a very smart purchase option for the average trail rider. It has plush suspension and a slightly lower seat height than most race/enduro models, and the liquid-cooled 400cc engine has plenty of power with a much less chance of getting you into trouble when you twist the throttle a bit harder than you expected to. 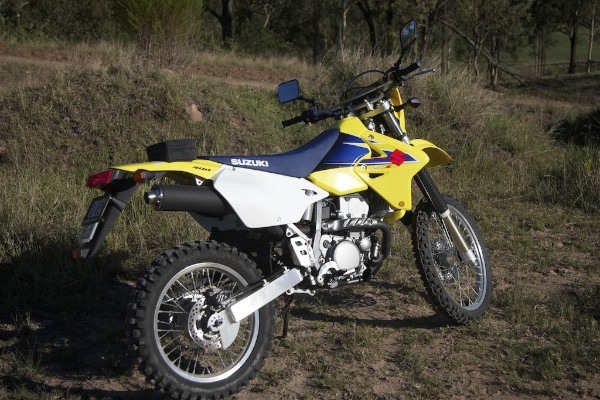 If I asked most of my mates who ride dirt bikes I bet they would admit the humble DR-Z400E wouldn’t get a second glance if they were wandering through a Suzuki dealership. I think most younger riders think it’s for old guys who want to potter around in the bush, or farmers tending cows. How wrong they are. This ‘humble’ bike is much more capable than most of us give it credit. Why do you reckon it’s been such a strong seller over the years? Looking at the bike you can see the engine and suspension aren’t exactly cutting edge. There’s no upside down forks, there’s no twin spar alloy frame, and the styling is dated compared to your average MX inspired enduro racer. It’s even got a tool bag on the seat. If that’s not old school I don’t know what is. But this thing is obviously built to last, and the 4-valve liquid-cooled engine is very reliable, and isn’t expensive to maintain. No I haven’t owned one but a search of forums showed an amazing lack of negative comments regarding this bike. Forums can be a good way of seeing if the model of machine you want is likely to be a good buy or not. No kick kick kick here, the bike has an electric starter which has an auto de-comp set-up to make starting easily. In fact there’s no kick starter. That said, the bike started easily during the test. I think part of this is down to a relatively moderate state of tune , as I’ve seen a few more highly strung off-roaders struggle to start, even if the battery is strong, and the right boot equally so. When the bike is going it doesn’t have the ‘urgent’ feel to the engine that many other enduro bikes have, and I liked that. I found it much easier to play trials rider on the DR-Z400E, and cruising along all sorts of roads, whether tar or dirt was relaxed. On one day during the test I did a 100 kilometre loop of country roads and firetrails and the bike loved it. I’ve even seen this model being ridden long distances when geared up to reduce touring revs. The riding position is designed exactly for this type if riding too, and the transition from sitting to standing is easy. I liked the way the DR-Z soaked up the terrible roads where I live. I would have expected that, and I even got to play around with the odd jump or two, and the standard settings were fine for that. Hitting a couple of decent erosion banks had the suspension bottoming out but I’m no featherweight, and the forks and rear shock are adjustable. Overall though, the suspension is well sorted for the anticipated use of t his bike. I think Suzuki have done a very good job in that regard. 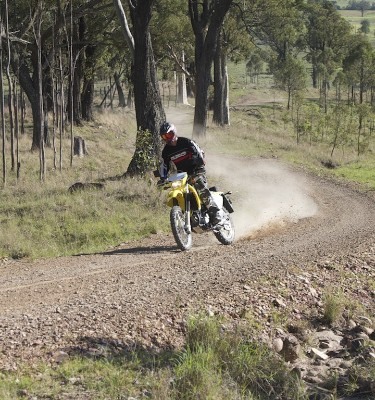 But there’s more to the mighty DR-Z400E. I also took it on some single trail and was surprised how well it steered and handled that type of terrain. I think the DR-Z400E is a vastly underrated bike, but then again it is a strong seller so maybe it’s not underrated by people who know better. At $8,990 ride away it’s a bargain, and probably best of all you can actually ride from home to the bush, and back again.